A couple months back I realized that although there are tons of infographics in the world, there aren’t many with a children’s literature focus. Let’s right that wrong. 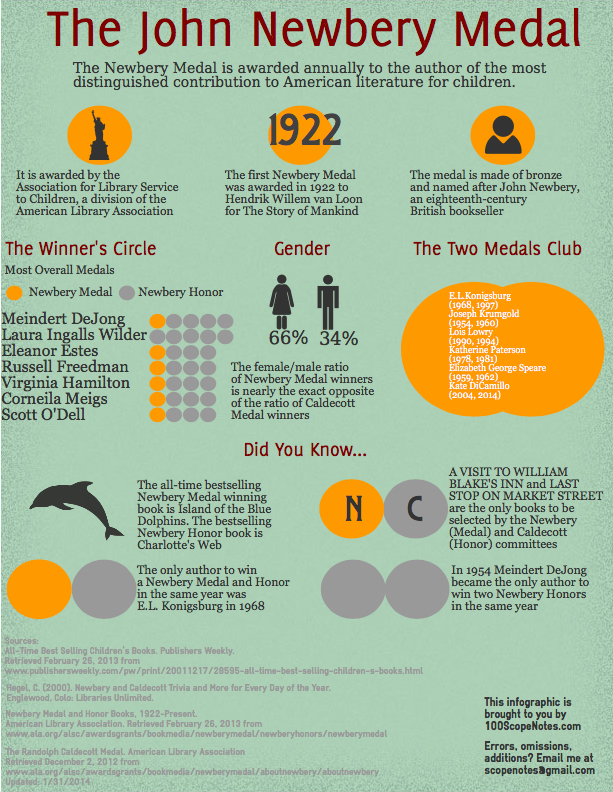 Last time out we had the world’s first Caldecott Medal infographic, and today we take on Newbery. Click to enlarge. Kind of frightening that most people don’t realize that ISLAND OF THE BLUE DOLPHINS is riddled with errors of bias and omission and stereotyping. Nice. I eagerly await the presumably forthcoming Geisel, Carnegie, Printz, Odyssey, Sibert, CSK, and Belpré infographics! Thanks, Travis. I missed the one you did on Caldecott, so I got to see two cool charts in one day–double the fun! These are wonderful. Thanks, Judy! They were fun to put together. This is amazing. Is the Geisel infographic next? Mo Willems would probably break some records on that one.